Everyone expected Halo news at E3 2018, but many people expected something a little more substantial than what we got. 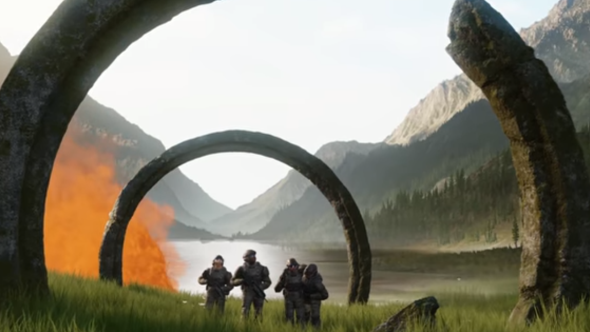 Halo Infinite was formally announced, sure, but in a brief trailer that served to advertise the new Slipspace engine more than to say anything about the game itself. Developer 343 Industries has said a little more about why this is via Twitter and its company blog in the days since, but it won’t give much succour to anyone who’s grown impatient in the three years since Halo 5: Guardians. Aim down some more exotic viewfinders in the best FPS games on PC. “When we started this project, the team’s vision for the game was ambitious – so much so that we knew we had to build new tech to fully realise our goals for Halo Infinite,” writes Chris Lee, studio head. “We still have a long way to go until we ship the game… though the engine demo is a clear indication of the direction we are heading and a great snapshot of where our tech is right now. So it definitely sounds like there will be a long wait for the next game, but there will at least be opportunities to get involved early. Lee mentions early access programmes that “will let members of the community play the game with us and give direct feedback,” and he’s also keen to hear from you via Twitter about the engine demo. Halo Infinite will be the first game in the iconic shooter series to release on PC at the same time as on Xbox, thanks to Microsoft’s recent push to unify the two ecosystems. As someone who never owned an Xbox, I am anticipatory, but as someone who never owned an Xbox, I have no basis to be actively ‘excited’. Just as well, since it’ll probably be a few years until we reach the Halo Infinite release date.